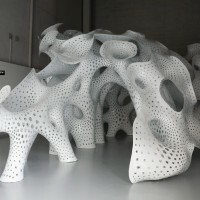 Marc Fornes of the New York-based design studio THEVERYMANY has sent us images of the nonLin/Lin Pavilion they have installed at the FRAC Centre in Orleans, France. 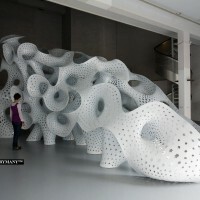 nonLin/Lin Pavilion – is a prototype which engages in a series of architectural experiments referred to as text based morphologies. 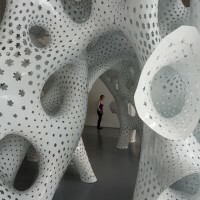 Beyond its visual perception of sculptural and formal qualities, the prototypes are built forms developed through custom computational protocols. 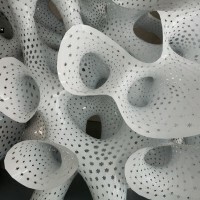 The parameters of these protocols are based on form finding (surface relaxation), form description (composition of developable linear elements), information modeling (re-assembly data), generational hierarchy (distributed networks), and digital fabrication (logistic of production). 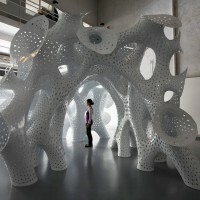 The Pavilion project refers to its own scale. 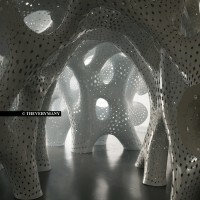 It is not considered a model of a larger structure or a building, neither is it an art installation. It is not made out of cardboard, or connected through paper clips. Its structural integrity does not rely on any camouflaged cables and it can resist water. It is light yet very strong. One could sit on it, even hang or climb it. It is scalable to a degree. It is not produced through academic facilities. 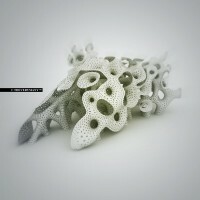 It is a prototypical architecture. 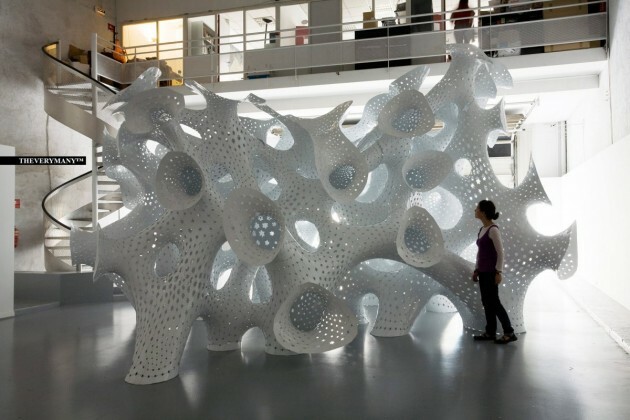 The cohesive morphology of the pavilion originates from a “Y” model referred to as the basic representation and lowest level of multi-directionality. 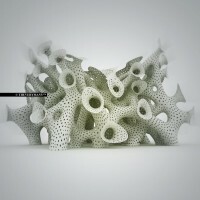 Such a premise was established in order to challenge issues of morphology since tri-partite relational models can not be formalized and described through a single bi-directional surface (ie: Nurbs surfaces) – which is yet still one of the main medium of representation within the avant-garde architectural repertoire. In order to resolve such an issue, it is required to address morphological models of change and introduce split or recombination – or in other words, how can one become two and two become one. The paradigm shift from linear spaces (tube or donuts alike) is important, not necessarily on a formal level, but rather in order to engage a multiplicity of social situations – pushing further than “bi” or dual alike. 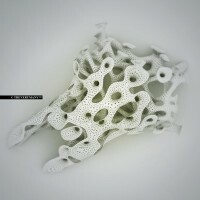 Dramatic Change of Morphology: From Network to Surface Condition. 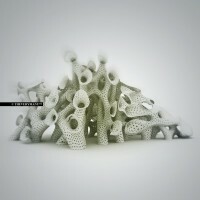 This prototypical structure is an investigation into transformations from one state to the other. Members within the structural network are opening up and recombining themselves into larger apertures while their reverse side is creating a surface condition providing that as density increase eventually provides to the person evolving within a sensation of enclosure. Local protocols of transformation are corrupted with overall hierarchies – such as varying radii for the members based on their position within the structural network. This orientation to the system results into a spatial environment with intrinsic and extrinsic moments. 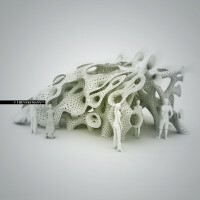 Custom computational protocols are describing the structure of the pavilion as a set of linear developable elements. Those singular elements can then be unrolled and cut out of flat sheets of material. Though due to the non-linear property of the model, this discretization process cannot be applied globally onto the morphology, but rather requires a search process. A global application strategy would fail due to its nature of reoccurring shift of defects within the distributed network (nodes with differentiated numbers of branches, changing types of double curvature, varying radii, etc). A local application strategy would distribute agents with local ‘search behavior’ tracing along the surface. These agents would provide immediate solutions based on local decision making, while in parallel, constantly communicating with their proximity based agents. This set of information can then be translated and materialized into a series of paths or stripes. 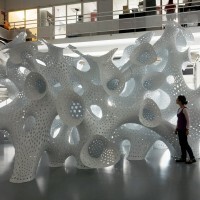 The Pavilion is redirecting from a current avant-garde strategy of applications populating discreet components onto an overall surface or host. This strategy also includes introducing iteratively varying and blending proportions (with linear or non-linear acceleration) across a range of surface domain. 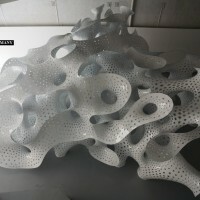 A precise description of such a prototypical structure requires massive number of elements, not only all unique but also morphologically extremely different. In order to describe and formalized all the different cases present (connection stripes to stripes, part to part, end rings, open edges, etc) -all requiring different properties (branches, holes, connection, grounded, etc)- one needs many types of agent behaviors, which generate forms of radically different morphologies. This kind of prototype deviates from a strategy of singular protocols or codes. The emphasis is now focused on multiple ontologisms, which form a sum of many different steps, procedures, and codes, where each component focuses on its own specific fitness. Such dichotomy of individual per formative processes allows a parallel development of multiple codes. A serious advantage of this process is highlighted within any decision making, allowing additional testing, trails, errors and a series of variations. This overall strategy allows controllability on a specific local level, while identifying nodes of complexity within the structure. This comprehensive understanding supports a precise level of repercussion of any relationship or variable within each code. 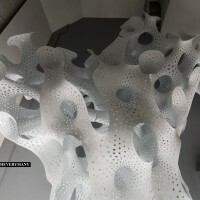 The project is conceived as a resultant product of a very explicit research line, investigating the design and build component of a coherent environment. It is considered to be self-supporting and to affect its participants, while engaging basic notions of limitation, filtration, and spatial depth. The structure is forming a eccentric universe where familiar elements such as openings or dimensional measurements turn out of model or scale. 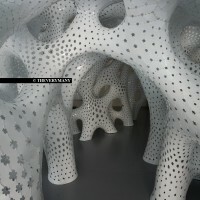 This visual phenomenon is allowing spectators to suspend disbelief while assigning cultural references or analogies from nature (corals, flowers) – yet nonLin/Lin Pavilion is only a very precise experiment toward constructability within a precise economical and cultural context.